Technology has created many sanitizing options. Making Better Spa and Hot Tub Sanitizer Choices. A ColorQ, all digital Water Tester can perform all of the common tests, while eliminating the color-matching and guesswork. With 10 models, performing up to 11 different test factors, one is right for every need. A Solar UV Sanitizer creates "free radicals" to help improve water quality and reduce chemical usage. 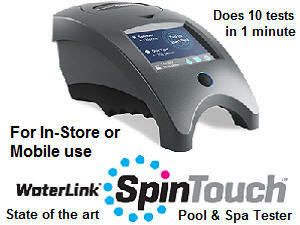 The WaterLink SpinTouch Labs are the ultimate, doing up to 10 different water test factors, in just 1 minute. How to choose an Alternative Spa, Swim Spa or Hot Tub Sanitizer? The phrase "Alternative Sanitizer" usually refers to something other than conventional forms of chlorine: the most popular sanitizing product. Alternative Spa Sanitizers include: salt chlorine generators, ionization-oxidation, ionizers, mineral sanitizers, ozone generators, ultraviolet sterilizers, hydrogen peroxide, biguanide (Trades names such as Baquacil, Baqua-Spa, Soft-Swim and Revacil) and bromine. Some alternatives perform best by being used in combination, while others can be stand alone. Some alternatives are other chemicals and others are generating or releasing devices. The quest for perfect spa, hot tub or swim spa sanitizing is ongoing. The goal is better sanitizing, more convenience, less chemical sensations and safety. What is right for any spa, hot tub or swim spa will depend on how it is used, by whom it is used, bather demand, importance of convenience and cost considerations. No matter which sanitizer is used, it is a good practice to shock the unit, at least once a week, especially after periods of heavy usage and at distinct signs of a loss of water quality. This will help to rid the water of organic buildups and prevent the development of resistant microorganisms. If problems arise, refer to the Spa Problems Page, as a source of problem-solving information, broken down into various categories. Scroll down the page and click on the linked keywords, catch phrases or images, in the archived answers below, to access additional information, on that topic or product. ► The Right Tester And Sanitizer? I have invested in nearly a year's supply of biguanide chemistry with the purchase of my new spa. My wife has sensitive skin and I thought biguanide would be the answer, I hope I have not just fallen for the biguanide hype. I spoke to the manufacturer about clarity, slippery walls and foaming and they suggested that I have the water analyzed at a professional pool store. They said that the slipperiness was probably caused by the hardness not being high enough and the foaming could be cause by the water not being hard enough or too much chemistry in the water. I have been chasing this for a while so there is a lot of chemistry in the water even though it is only a couple weeks old. I took both spa water and unaltered supply water in for analysis and they used the same test strips I have at home, but put them into a computerized reader and it printed out the results. I have a 485 gallon spa. The analysis showed the pH was 8.1 and they recommended 2 oz. pH Down; the Biguanide was 25 and they suggested 2 oz. of biguanide sanitizer and the hardness was 160, the dealer did not recommend hardening the water, but I added the recommended 10 oz of Hardness Increaser because biguanide manufacturer said this could be part of the foaming problem. I added the chemistry last night and this morning my spa is still slightly cloudy and is still foaming. I added some Foam Disperser and that helped a lot. I also added some biguanide water clarifier to see if this might help by tomorrow. I got the analysis of the supply water and if the spa does not sparkle up and the foaming go down I may drain, clean the filter and start over. I didn't use to have a foaming problem so it may be a build up of chemistry. The water is not that old but I have been chasing this problem for a couple weeks now and have tried a lot of different things. My question is, would it be a worthwhile investment to purchase your ColorQ Biguanide PRO 5 Water Analyzer so I could hopefully dial in the biguanide chemistry or should I abandon biguanide and a couple hundred dollars of chemistry to try another system? I would hate to buy the analyzer, then abandon biguanide, that would cost a lot of money. Can this analyzer be used for other systems too if I change systems? I like the idea of biguanide being non-irritating and we have been very happy with the results so far. except for the clarity and foaming issues. I don't mind putting in effort and expense to get the biguanide balanced and effective, but if the time and money are wasted and I will never get the results I want I might as well bite the bullet and switch to another system. Should I buy the analyzer? Is it accurate enough to get my spa dialed in with biguanide or is it a losing battle? I wasn't planning on answering letters today, but yours hit a chord. Although I do sell a tester for biguanide, I suggest that you not purchase it, even if it is a better tester than what the dealer is using. The reason being, that I suggest you permanently switch to another sanitizer. Test strips, even the best, are not precise. In my opinion, using a scanner and computer to read them, doesn't increase the precision and may actually provide less reliable results. Have them run the same sample twice and see what happens. The slimy walls are a positive sign of inadequate sanitation. It is not uncommon, for biguanide users to develop sanitizer resistant microorganisms. Some dealers do everything that they can, to keep you using the product, not because it is chlorine free, but because it is profitable. Foaming and biguanide go hand in hand, as the material is known to foam, when agitated or aerated. Foam presents another sanitizing issue, as proper sanitation demands that the foam be eliminated, at some point. Otherwise, the ecology of the foam will be different, from that of the spa water. The problems you are experiencing will only get worse and will continue to be a wasteful expense. I suggest that you drain and clean the spa and prepare to use another sanitizer. I realize that your wife has chemical sensitivity issues, which drove you to biguanide, in the first place. I agree that chlorine, as used in a spa, can be both odorous and irritating and can detract from the experience. Bromine would be a better choice in terms of both odor and irritation. Instead of simply using bromine at the suggested 3-5 PPM, I suggest that you consider using alternative sanitizers, that can be chemical-free or add only minimal amounts of innocuous metallic ions. If this is done, the bromine usage will be minimized, to the point that its presence will go unnoticed. With the right equipment, almost any measurable amount will be enough. You can use a Mineral Sanitizer and an add a UV Sterilizer, which adds no chemicals at all and kills virtually all microorganisms passing through the cell. It isn't used alone, but can be combined with other alternative sanitizers, to help reduce the chemical presence and afford real backup sanitizing. A salt chlorine generator works very well. by itself, or in combination with these alternative spa sanitizers. It is the better way to do chlorine. I hope that this information will prove helpful. Have a happy July 4th. ► Can't Use Chlorine Or Bromine? I'll bet that this one will stump you. My wife and I cannot use chlorine or bromine without affecting our Iodine levels and our thyroid. Our doctor suggested using Iodine as a sanitizer since it is a member of the Halogen family (fluorine, chlorine, bromine, iodine). I searched the web and found many sites referencing the use of Iodine, but only one briefly mentioned the PPM of 7-10 for a wading pool. Do you know what the PPM should be and what would be the best oxidizer to use. One site mentioned Hypochlorite which reintroduces chlorine back into our spa. We are currently using a non chlorine shock. The water is reasonably clear; algae and odor free, and has the slight greenish tinge that the web sites described for Iodine sanitized spas. We do get foam, shortly after adding the Iodine which de-foaming products easily take care of. pH is 7.8, when I add pH minus it comes down for a while then creeps back up. Total alkalinity is about 120. Any advice or tips for using Iodine would be appreciated. Of all the information sites I have found yours is the best. Thank you. Close but no prize. Unless this is an EPA registered sanitizer, I don't feel that this is an area that I want to venture into or that you should pursue. Instead, let's help you maintain a spa without non-chlorine shock, chlorine or bromine and with fewer chemicals. Add a, Ultraviolet (UV) Sanitizer. It will kill virtually all of the microorganisms in the return flow, without any chemicals. UV sanitizers require that an oxidizer be added to the water, to destroy organic wastes and accumulations. 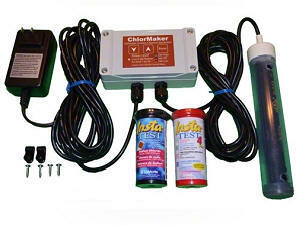 Instead of using non-chlorine shock, chlorine or bromine, you can use an ozone generator. It only adds a form of oxygen to the water. Because ozone does not remain in the water for prolonged periods of time, you should have a persistent sanitizer, that will prevent growth in the spa water and on the underwater surfaces. Add a Mineral Sanitizer and all that you will be adding is a trace amount of silver ions. Fewer chemicals will be required and the water quality will be better. This regimen will be easier to maintain and halogen free! I hope that this information will prove helpful. Alan, We're just about ready to have our hot tub installed. I've been looking at the various ways to keep the water clean. I came across this a natural enzyme based product. Is this for real, what would be the shortfall using this method to keep the hot tub water clean? Thanks for all your ideas, they are very informative. If you don't control infectious bacteria, such as pseudomonas and e. coli, you can end up with a rash or worse. This product is not a recognized sanitizer. I have heard it described as being like lake water. Check the label. Does it have the EPA Registration number that a sanitizer must have? Evidently, this product, can under certain circumstances, work. I suspect that it can be overwhelmed due to high bather usage and that can lead to problems. I would rather use a product that I can measure and test and that works under virtually all properly maintained conditions. I suggest that you consider a more traditional spa water sanitizer. Bromine, Chlorine, Salt Chlorine Generators and a Mineral Sanitizer in conjunction with an Ozonator or Ultraviolet Sanitizer will afford much greater protection. I'm glad that you found the website helpful. Good luck and enjoy the spa. How to get better results using alternative sanitizers. 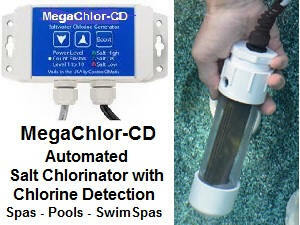 Use a Salt Chlorine Generator for more consistent control of chlorine levels. Vacuuming up any fallen debris helps reduce chemical usage. A Nano-Stick Clarifier will help remove fine particles. An all-digital ColorQ Tester is easy to use and provides reliable results. Using a Pre-Filter, for all new water additions, help keep contaminants and metals out of the spa. No Installation required. 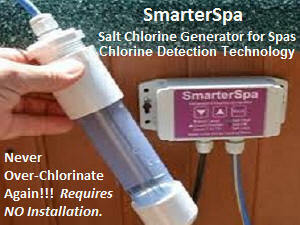 Salt Chlorinator, with Chlorine Detection. Keeping the spa or hot tub floor free of sediments produces better results. Nano-Technology helps remove fine particles. Last up to 4-6-months. ColorQ all-digital testers provide reliable results, with all sanitizers. Use a Pre-Filter, when adding new water, to keep minerals-metals out. ► An Algaecide In A Spa? We have a spa that is located outside and is used all year. In the summer, we don't use the heater and more or less use it as a pool for the kids. Should I be adding algaecide - like they do in pools? Most spas do not use an algaecide. Inasmuch as spas are usually heated and, therefore, are covered when not in use, the normal spa sanitizers are able to control algae. In your case, especially, if the spa is left uncovered in the summer, the addition of an algaecide might be worthwhile. However, you cannot add just any algaecide. The only one that I would recommend is the Polymer (polyquat) type. Other algaecides could cause excessive foaming, in a spa, and should not be used. The polymer types are non-foaming. Follow the label directions and use an appropriate amount! I hope that I have been helpful. ► Needs More Than Just Hydrogen Peroxide? Our sole water supply is lake water. In our hot tub we use only hydrogen peroxide as a sanitizer for health reasons We are finding that we must shock it daily with at least a cup of hydrogen peroxide to get it up to the required ppm. You mention adding a mineral sanitizer. Will this make it ppm hold longer? Is a "mineral sanitizer" a natural product? Hydrogen peroxide is not recognized as a spa sanitizer. You could add a mineral sanitizer, as well, since it will provide additional, persistent sanitizing. They are EPA registered as a spa sanitizer. However, it must be used with an oxidizer. While hydrogen peroxide will fill the oxidizer role, I am not sure if it will suffice. In any case, it will improve the current situation. All a mineral sanitizer adds to the water are silver, copper or zinc ions. You can reduce the hydrogen peroxide requirements, by using a METALTRAP 1 Micron Pre-Filter to treat all new water. It simply attracts to a garden hose. You can also use it, with a small submersible pump, to recirculate the hot tub water. This will remove organic contaminants and even many microorganisms, that have built up, due to bather usage. I hope that this information proves helpful. Thank you for taking a question! I have read on your site that it is not recommended to use copper sulfate primarily in a pool. Of course, our pool installer is really pushing a copper sulfate product to use instead of chlorine. I am guessing that this is a new product that is not dangerous in large quantities. as normal copper sulfate would be. Are you familiar with this new way of keeping a spa clean? Any advice would be greatly appreciated. Thanks. Copper sulfate cannot replace chlorine! Chlorine is a sanitizer and an oxidizing agent. Copper acts, primarily, as an algaecide. Copper can be useful as part of an overall pool maintenance program, in conjunction with other products. Copper sulfate must be used only at very low and controlled levels: otherwise, staining and discoloration can result. Virtually all of the copper containing products are based on some chelated (stabilized) form of copper. Copper is rarely used in spas. What spas need are active sanitizing and oxidation: something best provided by the use of ozonators, mineral sanitizers, salt chlorine generators, chlorine and/or bromine. The product that you are referring to is not copper sulfate, but is some complexed form of copper. While it might provide some control of algae and bacteria, it cannot be used as a stand alone water treatment. It must be used with an oxidizer or shock. If you want a spa that is less reliant on chemicals, consider an ozonator! All you will need to do is maintain a low level of a backup sanitizer, such as a mineral sanitizer chlorine, bromine or possibly this copper product. Shock will not be required on a regular basis, because of the ozonator. Water maintenance will be easier and the quality will be better. I hope that the information proves helpful. We have a hot tub and would like to use hydrogen peroxide instead of the normal chemicals. My husband is allergic to the chlorine and bromides. How much Hydrogen peroxide do we use and what %. We were told that it should be a 10% concentration but we can't find any hydrogen peroxide above 3%. I thought maybe you could help us. Also do we nee to use any kind of a shock at the first? Hope you can help? Thanks. I am not sure that using just hydrogen peroxide will provide adequate sanitation. In pools and spas, it is used as a shock treatment with biguanide. It is available in concentrated form in many pool and spa outlets that offer biguanide products. Have you considered the use of an ozonator and a mineral sanitizer or ionizer. This combination would come close to being chlorine and bromine free. The ozonator could negate the need for hydrogen peroxide and a mineral sanitizer or ionizer would release metallic ions and act as a persistent sanitizer. Hydrogen peroxide can be used as a shock treatment, with a mineral sanitizer or ionizer as the primary water sanitizer. However, in most cases better results are obtained, if you maintain a low level of chlorine or bromine, which you can add during periods that the spa will not be used, along with a mineral sanitizer and ozonator. I hope that I've been helpful and given you some food for thought. Good luck with your decision. I have started using Hydrogen Peroxide in my hot tub and I need some help. I started with fresh water (400 gallons) and added 1 cup of Hydrogen Peroxide. This appeared to work great for the first couple of weeks. Now, it has been about four days since we used our hot tub and when I opened it up, the water was quite discolored (greenish-brownish). What can I do? Do you use other products in conjunction with Hydrogen Peroxide such as pH products. My hot tub is outside. Thank you. Hydrogen peroxide is not recognized as a spa water sanitizer. It has to be used in conjunction with a persistent sanitizer and the o verall spa water chemistry has to be maintained. Your description of the water proves the point! The addition of an ozonator is something that you should consider, as it will make maintenance easier and produce higher quality water. It will reduce the chemical consumption. You might add a mineral sanitizer, as well. The combination of the two work well together. All you should need is a very low level of bromine, as it will act as confirmation that proper conditions are being maintained. Instead of the ozonator you could use the hydrogen peroxide. I believe that you better off starting with a clean slate. I would clean the spa and start anew. Have the source water tested for metals. If present, you should use a METALTRAP Filter, to remove heavy metals, which can cause staining and discoloration. You might consider a salt chlorine generator, which is the better way to do chlorine. We have several no-installation required models are 2 of them are "smart enough", to only produce chlorine, when it is actually needed. Can't do that with peroxide. I hope that this information helps get you off to a better start. It looks like I have developed a skin reaction/rash to Potassium Peroxymonosulfate that I have been using in my hot tub. The product has 45.2% Potassium Peroxymonosulfate that has 4.7% active oxygen). I am wondering if I can use hydrogen peroxide (H202) instead and what the differences are between these two compounds (eg: will H202 cause the same skin reaction as Potassium Peroxymonosulfate). Do you think the H202 products that another web site mentions are OK to use? Here is what the relevant sections says: "Hydrogen peroxide is available at most spa stores, under the category of oxidizers or shock treatments. Since it is sold as a cleaning agent, most spa stores are unaware of its value as a sanitizer. Several brands don't even indicate the contents on the bottle. (A Federal MSDS Report can be requested from any manufacturer for a list of ingredients and potential health hazards.) Three brands are certified to contain 27% hydrogen peroxide: Another web site says to get H202 test strips and maintain the H202 level between 50 and 100 ppm. I am hoping that H202 will do the trick to allow me to sanitize my hot tub and not have to use bromine tablets, which I used to use but don't anymore due to their (or their by products) cancer causing properties. Thanks in advance for your help. 27% Hydrogen peroxide is dangerous stuff. It is not registered by the US EPA as a spa sanitizer - only as an oxidizer. To suggest that it is a spa sanitizer would be a violation of federal law. I have gotten numerous complaints about rashes, due to excess MPS. I also have gotten letters about bromine rashes. Bromine tablets contain something (dimethyl hydantoin) not found in chlorine pools or spas, so you may not have encountered this chemical before. I would give them both up and go with dichlor chlorine, a mineral sanitizer and Ozone. Or consider a salt chlorine generator. It will provide more control and better results. We have several no-installation required models are 2 of them are "smart enough", to only produce chlorine, when it is actually needed. Salt chlorine generators are cost effective and eliminate many negatives issues about chlorine, such as: odors, handling and storage. Chlorine has a long, safe history of use. Free chlorine is the active sanitizing form of chlorine and the recommended level is 1-3 PPM. Very much higher levels can be irritating. As a backup to chlorine and to allow good results, while maintain a lower chlorine level, you give thought to adding a Mineral Sanitizer, which will help you maintain a free chlorine level at 1/2 of the normal level and still maintain proper sanitation. To further improve the water quality, an Ozone Generator will make a big improvement and reduce chemical usage. It will provide oxidation and reduce chlorine usage. The ozone is short lived and adds nothing else to the water. I hope this information will help make the hot water experience more pleasant. We recently purchased a vinyl hot tub and are running it inside in our bedroom. I just learned about NTM and the dangers of inhaling the microorganisms while soaking in the tub. Can you tell me if enzyme products are effective against NTM (I am sensitive to chlorine so that is not an option for me). We are currently using a product, which the dealer said was approved for hot tub use. My understanding is that it is a copper based product, which is also used as a pesticide. Although it may be better than chorine for me, I would prefer something more natural. Anything we would use would have to be OK to use in this type of tub. We look forward to your assistance. Non Tuberculosis Mycobacteria (NTM), according to Center for Disease Control (CDC) information, is not something unique to spa or hot tub use. These are bacterium, that are found in the environment, and can be opportunistic in their growth. Bacterial growth can be the direct result of inadequate sanitation. Although chlorine and bromine are effective spa sanitizers, I can appreciate that you are sensitive to chlorine (and probably bromine, as well) and need to find an alternative spa sanitizer. However, you are relying on products that are NOT bactericides! Enzyme products are not approved spa sanitizing agents. I am not familiar or knowledgeable about the specific product, that you are referring to, but if it does not have an E.P.A. registration number, it is not a registered spa water sanitizer. The other product may be approved for use in your tub, but it is NOT a bactericide. It functions as an algaecide and that does make it a pesticide. However, not all pesticides are bactericides! You have several good choices, of alternative spa water sanitizers, including: ozonators, mineral sanitizers, ionizers, ultraviolet (UV) sanitizers, biguanide or a combination of more than one. An ozonator can be used with either a mineral sanitizer or ionization unit and can provide effective spa water sanitizing with a minimum of chemicals. Biguanide can be used, in conjunction with hydrogen peroxide, as a spa sanitizer. Please refer to the archives on these products for information on their spa usage. I hope that you will help this information helpful. Over the past 12 years of enjoying my spa, I have developed an extreme intolerance of bromine. Even very low levels of 1 ppm or less are enough to trigger an eczema rash. Last year, I tried switching to a copper ion sanitizer system ,which immediately eliminated the rash problem, but I have discovered that copper ion is banned in Canada due to its effect on fish populations. My question: Is there any reliable long-term sanitizer system that is completely bromine and chlorine free? I have an ozonator, which is an oxidizer only and must be backed up by a sanitizer. Biguanide seems to be only a short term solution only because of the tendency to build up resistant organisms, and following the links to the mineral sanitizers and UV sanitizers you mention suggest that they reduce, but not eliminate the need for bromine. Assuming that you're a typical person, you have been in swimming pools that used chlorine. You may not like the smell, but you should be able to virtually eliminate any significant odor. The point is that you are probably not sensitive to chlorine. Bromine tablets contain dimethyl hydantoin. This chemical is only found in bromine-sanitized pools and spas. The high spa temperatures make development of a rash even more likely. The first thing you should do is drain and clean the spa. That will get rid of the dimethyl hydantoin. The ozonator will provide all the oxidation the spa should require. The problem is that it is short-lived and a persistent sanitizer is required. The copper helped fill that role. It is best to run the ozonator for periods spread throughout the day. You still need a persistent sanitizer and I suggest chlorine. Keep the level at 0.5 to 1.5 PPM. Both the ozonator and oxidation units will destroy the odorous, irritating forms of chlorine, resulting in little or no odor. Because there is so much oxidation, the chlorine will only be needed for sanitation and not oxidation. It should take very little chlorine to maintain this level, if the ozonator operating, intermittently, throughout the day. Biguanide sounds like a possible choice, but my mail suggests that you will encounter problems, within a few years and have to make a switch. You seem to have concluded the same. As for the rash and this regimen, please discuss this with your doctor. No matter which sanitizer you choose, adding a Nano-Stick Clarifier will help you reduce chemical usage and yield better water clarity. It is chemical-free and can last for 4-6 months. Please let me know how this works out. ► How Does A Mineral Sanitizer Work? I'm using a Mineral Sanitizer Cartridge in my spa. I add some non-chlorine shock after each use. I like it because there is very little odor, if any. Exactly, how does this cartridge replace chlorine? The cartridge contains silver, in a form that allows for slow release into the spa water. This is done without the use of electrical components, as is the case with Ionization Units. The silver is released into the water in ionic form. This is the most active form and allows the ions to function as sanitizers, at very low concentrations. Chlorine is normally used to provide this type of sanitizing action. However, chlorine will also destroy and decompose organic wastes and debris. Because metallic ions cannot destroy the organic contamination or prevent further buildups, it is necessary to add an oxidizer to do this job. That is the reason for adding the non-chlorine shock. Maintaining a free chlorine of that favors the low end of 1-3 PPM, helps assure proper sanitation, at all times. The use of the Mineral Sanitizer should reduce the overall chemical usage and make control of the water chemistry easier. An ozone generator is the easiest and best way to perform the oxidation of wastes and byproducts, without contributing chemicals or odors. Enjoy the spa. I hope that I have been helpful.